No, I am afraid you won’t get a picture of a sloth engaging in upside down cuteness on these austere pages. But here is one of some dogs. 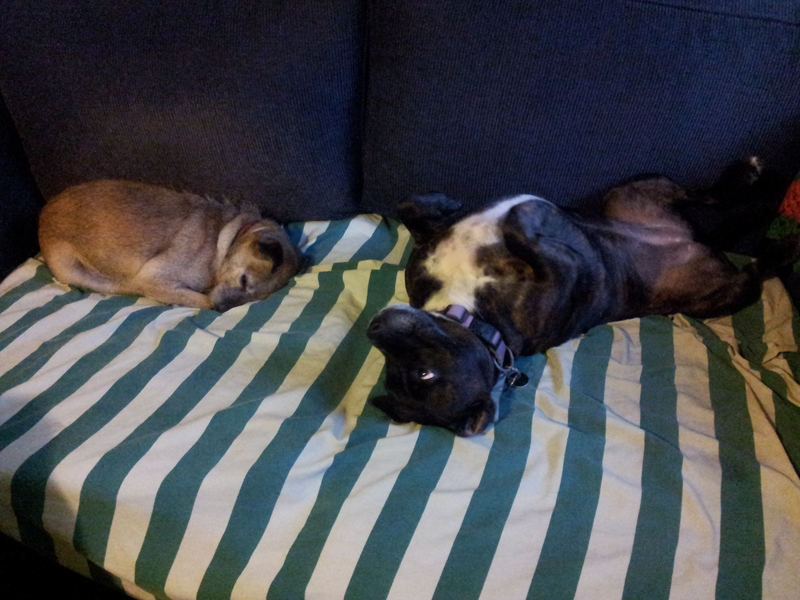 One of them is even upside down, and some say she is a cross between a dog and a sloth. I have been at the beach for a week or so, and relatively slothful, aided by very dodgy internet access. Although I did enter the best poetry competition, whereby a list of ten words is provided and the entrant/masochist must write a poem containing each of the words. In 48 hours. There are, it seems, very few sloths in Canada. That festival of energetic composition is organised by Contemporary Verse 2. For some poets, this contest would seem overly prescriptive, but I quite like the challenge of using the ten words without them screaming ‘We were given, not found’. It keeps you on your poetic toes. If you would like to read a poem I wrote which did not derive from a competition, please press this link. The poem deals with space and jazz, and is called ‘Miles and Beyond’. It was just published at Eye to the Telescope, which is the online journal of the Science Fiction Poetry Association, based in the United States, a nation to the south of Canada, also bereft of sloths. Diane Severson edited this issue, which is made up of speculative poetry about music. In fact, including sloths here might be described as slothful. The issue of Midnight Echo I mentioned in my previous post is now available for purchase. It is currently only in PDF, but will soon be available in different formats. I wrote a column about poetry and an actual poem for that issue, edited by Kaaron Warren. Midnight Echo is now also in epub and mobi.